Ramo Stott waves at the crowd while take the checkered at Bristol. 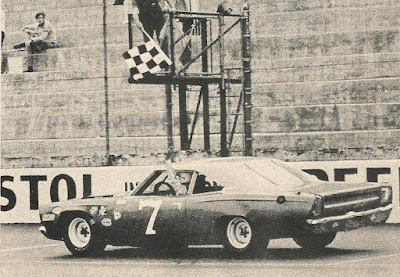 Bristol, Tenn. (May 18, 1969) – Ramo Stott of Keokuk, Iowa, twice ran out of gas at the Bristol International Speedway, but still managed to win the second annual Tennessee 500 stock car race by 10 laps. 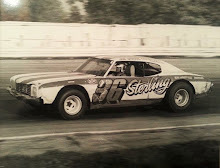 The race was sanctioned by the Automobile Racing Club of America (ARCA). 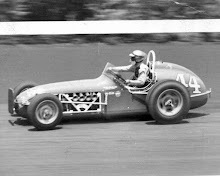 Stott guided his multi-colored 1969 Plymouth to a first-place finish as rain halted the 500-lap contest at the 412-lap mark. 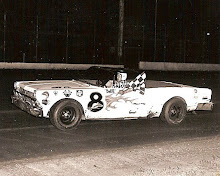 Stott was 10 laps ahead of second-place finisher Andy Hampton of Louisville, Ky., in a 1969 Dodge. Stott average 73.163 miles per hour as three caution flags slowed the pace for 43 laps. The last 21 circuits were run under caution as a steady drizzle slowly soaked the approximately 6,000 race fans in attendance. 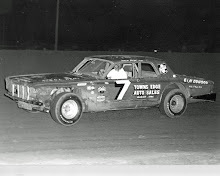 Pole-sitter Benny Parsons of Detroit, Mich., driving a 1969 Ford, was 11 laps behind in third place. 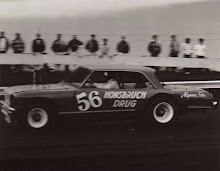 Bobby Watson of Prestonsburg, Ky., the 1968 Tennessee 500 winner, was fourth in a 1969 Dodge and Iggy Katona of Willis, Mich., was fifth, 16 laps behind in a 1969 Dodge.